Up to 32 voices at your fingertips. 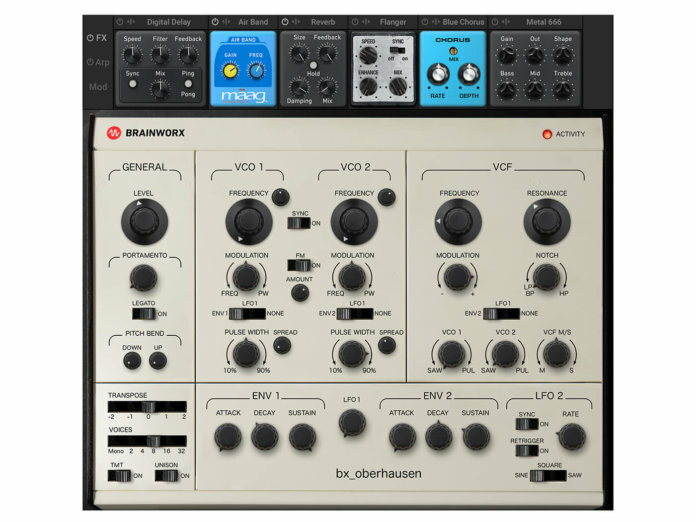 Brainworx Audio has made its first foray into virtual instruments with the bx_oberhausen synth, modelled after Tom Oberheim’s Synthesizer Expander Module (SEM). This new plug-in features all-analogue modelling with full polyphony of up to 32 voices, superseding what its forbear could deliver. The voices can be combined in a Unison mode, which can be used with Brainworx’s Tolerance Modelling Technology (TMT) for complex, analogue-like sounds, as the brand claims. TMT, which also features in the brand’s SSL 4000 plug-ins, aims to “accurately replicate individual component variations specified by the manufacturer”, according to Brainworx Audio. Elsewhere, the bx_oberhausen features Mid/Side (M/S) processing, letting you determine which sound part passes through the filter section. The result is a variety of processing modes spanning bass-loaded foundations to off-kilter stereo options. As a final touch, Brainworx Audio has also included effect plug-ins like Mäag Audio’s Air Band EQ, offering you more sound-sculpting options on the bx_oberhausen. Available from 16 April at $179 (RRP $249). Compatible with PC and Mac. More info at brainworx.audio.